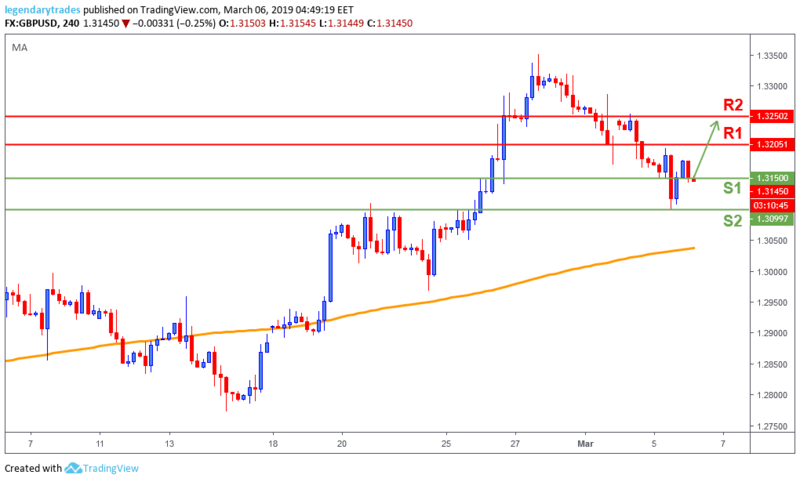 GBPUSD fell in the beginning hours of Tuesday’s trading session as not-so-encouraging Brexit headlines weighed on the pair. First, it was the Fin Min Hammond, who said that he wasn't expecting a breakthrough in conversations between UK Attorney General Fox and the EU's Chief Brexit Negotiator Michel Barnier. Later, UK's McDonnell said that not many Labour MPs are likely to back May's Brexit plan when it gets to the Parliament next week. However, later in the day, BOE's Carney testified that investors had not priced in enough monetary tightening ahead, which changed the market sentiment and led the market to erase the daily losses and close positive. In economic news, two BoE members will be giving a speech. Traders will focus on any more clues for a possible monetary tightening in the near future. The Pound pulled back and touched 1.31 (S2) before the buyers stepped in and took the price back above 1.3150 (S1). The bulls need to break above 1.32 (R1) to gain back control. Alternatively, if the Sterling loses the 1.3150 (S1) support, then the sellers will likely weaken the price for a 1.30 (S2) retest.